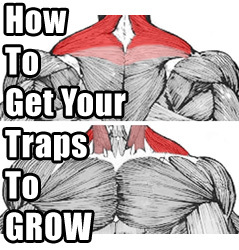 If your traps aren’t where you want them to be, I’ll tell you how to get them growing again. 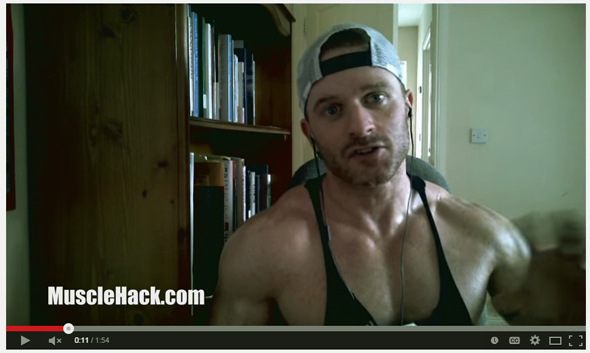 Recently a reader commented on one of my videos that my traps had come along in recent times. Traps have always been a stubborn body part for me. But over the last year or so, I’ve had better growth than about the previous 5 years combined! So how did I do it? What did I change? And how can you get your traps to grow again? For constant tension to be applied, you need to ensure that your traps are doing all the work and that you take no pauses or breaks in the set until you reach muscular failure. The negatives (lowering) of each rep should also be executed more slowly than the positives….AND…be carried out under full muscular control i.e. the traps are doing all the work. Additionally, you want to lower the weight all the way to the bottom so that the load feels like it’s “hanging” off your arms. Basically your arms are like dead weight, like chains holding onto the bar, the bar then pulls the traps down creating a “stretched” feeling across the intended muscle. This is the proper “bottom” position for shrugging. So all the way down, and all the way up ensuring the traps are doing the work. There are also 2 exercises that I believe were predominantly responsible for this renewed growth. 2 movements that I had been neglecting, but I now swear by. You’ve more freedom of movement with dumbbells than a barbell, which I believe allows for a fuller contraction of the traps. Also, if executed properly, an upright row with an EZ bar is an extremely effective movement. I’ve taken a pic of where to hold the bar. If you want a more thorough explanation of constant tension, watch my video below. If you want my full free training package, download THT training below. You can expect results like this fast! Join 67,000 others and let today be the beginning of a new way of training which will finally bring you the results you desire. Just input your email below (it’s totally FREE). P.S. If you’re not lean and need to cut, there is no better fat loss program than Total Six Pack Abs in my honest opinion. A new year is coming in a few short weeks – change your life! Now that’s 2 exercises I have neglected too. Going to add them in the with constant tension. Buzzing for my next workout! Standing on the seat and doing your shrugs. We LOVE YOU BRO ! good stuff. do you use wrist straps with shrugs? @James. I have done in the past. At the moment I don’t require them. But if your grip strength goes before you reach failure of the traps when shrugging, go ahead and use them. Im a truck driver so I sit for about 10 hours a day. I need the best way to get rid of this big belly. @Mark. The program I have for blasting fat is Total Six Pack Abs. The food/diet is the most important factor in losing that gut. There are 3-day, 5-day, and 6-day training options. So as long as your job allows you to train 3 times a week, you can do the plan 🙂 Hope that helps. Nice work if that’s what you wanted. I personnaly really don’t like traps at all. All my good looking & smart previous GF had the opinion that big traps are not aesthetic because they create an ugly triangular gorilla effect. Looks good on you, but I’m trying to find ways NOT to activate my traps when doing shoulders… Any ideas anyone? if you are not doing direct work on them,you are just really activating them minorly and unless you are genetically gifted they wont grow with indirect work. rows maybe one exercise that might activate them a bit more. but unless you are not hitting them directly,you dont need to worry. I have a very small home gym. By necessity I come up with things that help me. For traps, aside from DB shrugs, I put a bar in a corner of the room, load the other end with plates and use an old set of handlebars off of a bicycle to hook under the bar and shrug it. Talk about a burn and my traps grew more in 6 weeks than they had in years of BB shrugs. Sometimes I use a thick rope knotted at both ends under the bar. That seems to hit the traps higher, up by the neck. Bot work excellent for bent rows too. Necessity is the mother of invention! @Space What @abi just said is exactly correct. If you’re not hitting them directly, you’ve nothing to worry about.